Materials and Methods: Eighty-eight patients were admitted to Mersin University Department of Neurosurgery between January 2007 and January 2017 for injuries of the OCJ and upper cervical spine and evaluated retrospectively. In the group, there were 60 male, 28 female patients in the mean age of 42.9 (18–87) years. Among those, 2 occipital condyle fractures, 28 C1 fractures (26 isolated and 2 with transverse ligament injury), 9 combined C1/C2 fractures, 6 rotatory C1/C2 dislocations, and 43 C2 fractures (32 odontoid, 5 Hangman's, and 6 miscellaneous fractures) were diagnosed. In addition to clinical cases, ten cadavers were used to study the OCJ in a step-wise manner. Results: Occipital condyle fractures, isolated C1 fractures, and rotatory C1/C2 dislocations were treated conservatively. Two patients with C1 fracture including transverse ligament injury were operated in one of the methods of C1–C2 fusion which is posterior sublaminar wiring. Five patients having Type II odontoid fracture were treated surgically. One instable Hangman's fracture patient was treated as anterior cervical discectomy and fusion. Conclusions: Cases with isolated C1 fracture with intact transverse ligament should be conservatively treated without surgical approach. Atlas fractures with transverse ligament rupture, odontoid Type II fractures with dislocation >6 mm, and unstable Hangman's fractures required surgical treatment. Vital neurovascular, ligamentous, and accompanying bone structures should be evaluated for diagnosis and treatment modality. In addition, patient's health status, patient's treatment preference, and surgical team experience are the affecting factors for the decision of surgery. OCJ is composed of multiple complex bones, joints, and ligaments. The Atlas More Details and the axis vertebrae are called “atypical vertebrae.” The first cervical vertebrae is named as atlas which is a ring-shaped vertebra composed of right and left lateral masses connected by anterior and posterior arches [Figure 1]a. The axis as the second cervical vertebra forms a pivot on which the atlas rotates. The most distinctive characteristic of this bone is the strong odontoid process which rises perpendicularly from the upper surface of the body [Figure 1]b and [Figure 1]c. Transverse ligament is the most important and strong structure of this region and contributes to the stabilization of OCJ [Figure 1]d, [Figure 1]e, [Figure 1]f. Atlas and axis have unique shape and important relationship with vertebral artery (VA). Moreover, VA is the most important vital vascular structure in the evaluation of OCJ and upper cervical traumas during preoperative stage [Figure 1]g, [Figure 1]h, [Figure 1]i, [Figure 1]j. It is useful to classify injury of the OCJ as isolated ligamentous injuries, isolated bone fractures, or mixed ligamentous and bony injuries. The extent of the injuries to the bones and ligaments is important for predicting the results of the treatment. Isolated ligamentous instabilities, C1 fracture with injured transverse ligament, Type II odontoid fractures with dislocation >6 mm, and Type IIA odontoid fractures are treated surgically. In addition, Type II odontoid fractures that had used external orthesis without fusion also need surgical treatment.,,,, Levine–Edwards Type II, IIa, and III lesions are unstable fractures and treatment modality is still controversial. Although these types of fractures are unstable, the rigid immobilization is recommended as initial treatment. However, this procedure may result significant deformity of C2–C3 level. Therefore, early surgical intervention has been increasingly performed. The aim of this study is to consider the OCJ injuries and to discuss the treatment modalities of these traumas and detailed evaluation of cadaveric studies for a better understanding of this complex anatomy in the light of literature. During a 10-year period (2007–2017), 88 adult patients were admitted to our clinic for injuries of the OCJ and upper cervical spine. Sixty male and 28 female patients in the mean age of 42.9 years (18–87) were retrospectively evaluated and followed for 26 (12–60) months in average. Two occipital condyle fractures, 28 C1 fractures (26 isolated and 2 with transverse ligament injury), 9 combined C1/C2 fractures, 6 rotatory C1/C2 dislocations, and 43 C2 fractures (32 odontoid, 5 Hangman's, and 6 miscellaneous fractures) were diagnosed [Table 1]. Patients were treated at the Department of Neurosurgery, University of Mersin, Turkey. The radiological investigation included plain radiography, flexion-extension radiography, three-dimensional computerized tomography (CT), and magnetic resonance imaging (MRI). Follow-up data included the accurate clinical and radiographic examination of the patients before discharge and also control scans at 1, 3, 6, and 12 months after trauma. All patients were followed for a period of at least 1 year. The first follow-up examination after 1 month included plain radiography, and the second follow-up examination after 3 months included plain radiography, flexion-extension radiography, and CT. Bony fusion was defined by the absence of motion on functional flexion/extension views and the absence of sclerotic borders adjacent to the fracture site. In addition to clinical cases, ten cadavers were dissected to study the microsurgical anatomy and to demonstrate OCJ in a step-wise manner. Microsurgical anatomical dissections were performed with a Leica, Wild M695 Surgical Microscope from ×3 to ×40 magnification at the Department of Neurological Surgery, University of Wisconsin–Madison, USA. Two occipital condyle fractures were Type I fractures. The treatment of this fracture was achieved with orthesis without surgical need. Type I occipital condyle fractures were followed conservatively. Any complications were not observed, and the patients did not have any complaints after treatment. The neurological examination was intact in all atlas fracture cases. Isolated fractures of atlas without transverse ligament rupture healed satisfactorily with an orthesis. Twenty-six patients improved with the external orthesis without any problem. Philadelphia neck collar was used in isolated anterior and posterior arch fractures while sternal-occipital-mandibular immobilization (SOMI) was used as a treatment modality in combined ring fractures or lateral mass fractures. A patient with widely displaced fractures was treated with halo brace. Posterior wire fixation of C1–C2 was performed in two cases of C1 fractures with transverse ligament injury without complication. Six patients with rotatory atlantoaxial dislocations were chosen with a treatment modality of reduction with or without traction and subsequent immobilization with a SOMI for 10–12 weeks. The neurological examination was intact in all cases. Early reduction (6 h after trauma) was performed in two patients with cervical traction by Gardner-Wells tongs. The patients were awake and did not report neurological deterioration during the procedure. After the reduction, immobilization using only a SOMI were performed and provided good clinical results [Figure 2]a, [Figure 2]b, [Figure 2]c, [Figure 2]d, [Figure 2]e, [Figure 2]f. The reduction is achieved in the other four patients without cervical traction. The same procedure is applied to these patients after reduction. Odontoid fractures included Type I in 3 patients (9.3%), Type II in 18 patients (56.3%), and Type III in 11 patients (34.4%). All Type I and III odontoid fractures were followed by Philadelphia and SOMI with a satisfactory prognosis. Nine patients with odontoid Type II fractures <6 mm dens displacement were managed by halo or SOMI. One patient who was in the terminal stage of malignancy was put on halo and died in 1-month period and the other too elderly (87 years old) patient died in the early stage of treatment. The last patient in this group, previously diagnosed as traumatic os odontoideum had been followed with external orthesis by another healthcare center underwent C1-C2 posterior segmental stabilization[Figure 3]a, [Figure 3]b, [Figure 3]c, [Figure 3]d.
Eight patients with Type II fracture >6 mm dense displacement were indicated for surgery, whereas there was a high risk of operation for 3 elderly patients (over 75 years) that have been indicated for surgery who were followed by external orthesis. Meanwhile one of the young patient was put on halo since she did not give concent for operation although surgery was indicated. 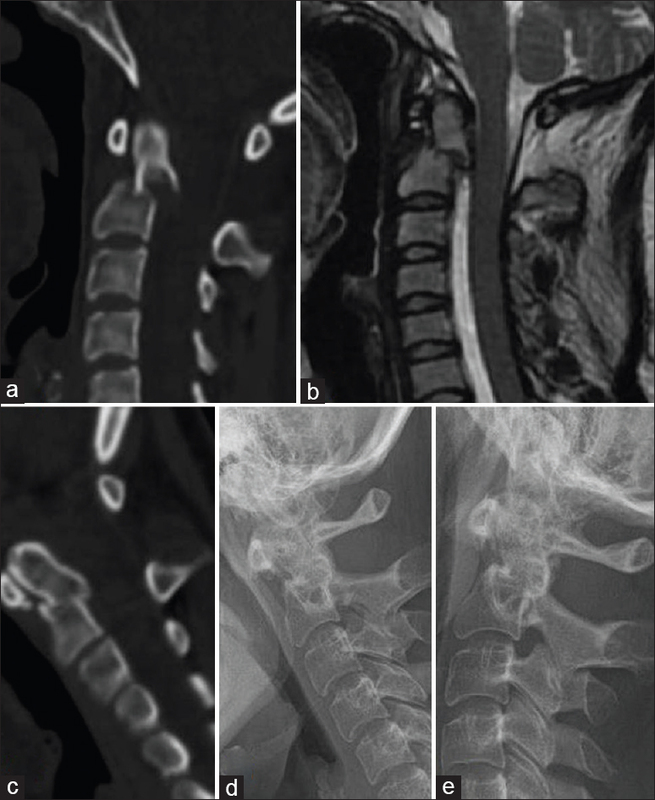 A moderate reduction was detected as a result of this fusion in follow-up radiological examination [Figure 4]a, [Figure 4]b, [Figure 4]c, [Figure 4]d, [Figure 4]e. Four patients with Type II fractures of >6 mm displacement were treated surgically; C1–C2 wire/graft in two patients and occipitocervical stabilization in two patients were performed as a surgical treatment modality [Figure 5]a, [Figure 5]b, [Figure 5]c, [Figure 5]d. In one of the patients that we performed occipitocervical stabilization had dysphagia in the 5th day of postoperation but improved in the follow-up period. 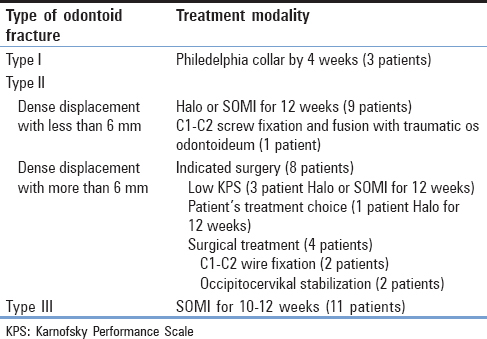 The treatment modality of odontoid fractures in our series is summarized in [Table 2]. In Hangman's fracture, three patients were accepted as Type I and one patient as Type II. Improvement in treatment without surgery was achieved in these patients. Type III fracture was determined in one patient who had excess angulation, and severe anterior displacement was primarily treated with anterior cervical discectomy and fusion with plating. In the postoperative period, when anterior and posterior alignment was not achieved in the malposition of the graft, reoperation was applied. Stabilization was done with adding below level vertebrae to fusion. Satisfactory decompression and fusion were achieved despite the insufficient alignment [Figure 6]a, [Figure 6]b, [Figure 6]c, [Figure 6]d, [Figure 6]e, [Figure 6]f.
In combined C1/C2 fractures, the treatment was planned according to the existence of injury of the transverse ligament and type of odontoid fracture. The transverse ligament was intact in all nine patients who were treated successfully with external orthesis. Instability was not detected in none of all six miscellaneous fracture patients with intact ligament. All patients were undergone to a successful treatment with external orthesis without neurological sequela. The assessment of transverse ligament injury has a great importance in the occipitocervical region traumas. If the midpoint or lateral periosteal insertion of transverse ligament is injured, the treatment choice should be surgery. In our series, there were totally two transverse ligament injuries. These two patients with this type of injury among the atlas fractures were operated. Occipital condyle fractures were first described by Bell in 1817 and classified as Anderson-Montesano Type I, Type II, and Type III. For occipital condyle fractures, only Type III is unstable and needs to be treated surgically. 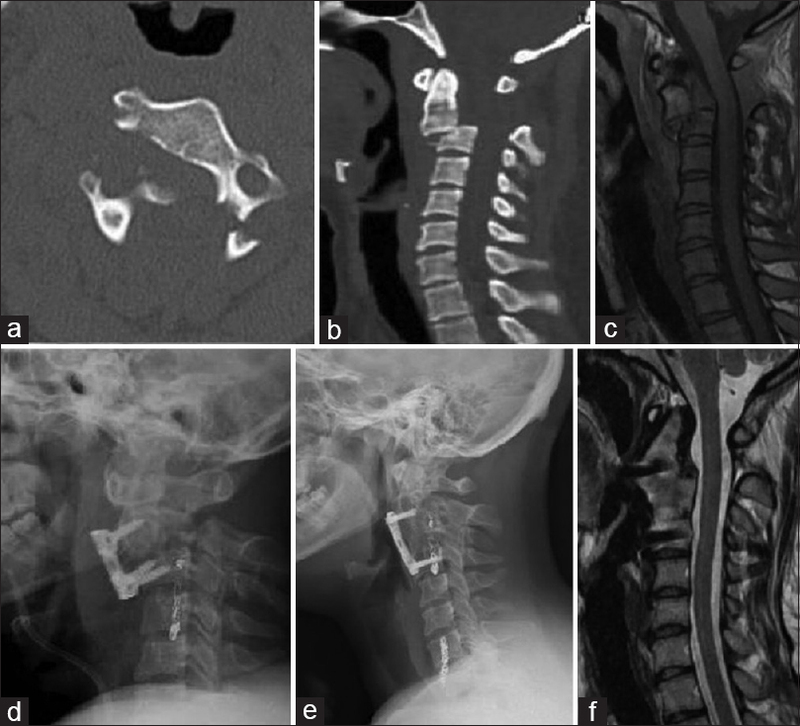 In our series, both of the two occipital condyle Type I fracture patients were followed by Philadelphia collar for 6–12 weeks without any complication. Acute traumatic atlas fractures account for 10% of all cervical spine fractures. Isolated atlas fractures were found in 30% (26 patients) in our OCJ and upper cervical trauma patients. These fractures commonly were treated conservatively which the fractures were nondisplaced or minimally displaced. The degree of fracture angulation and displacement gives an idea for stability of the transverse ligament. Minimally or moderately displaced fractures can usually be treated successfully with a cervical orthesis. Surgical treatment is generally preferred lateral mass displacement with >7 mm, ruptured transverse ligament, and concomitant C1–C2 fractures. The isolated anterior or posterior arch fracture of atlas patients was followed with Philadelphia collar for 4–6 weeks. In this group of traumas, the lateral mass and ring (combined anterior posterior arch fractures) fractures with minimal displacement were followed with SOMI brace. Only one patient with lateral mass fracture including a major displacement was put on halo for 12 weeks. Although this type of fractures that has greater than 7 mm lateral mass displacement is advised to be operated in literature, all isolated atlas fractures without transverse ligament injury could be managed conservatively according to our clinical experience. Traumatic rotatory atlantoaxial subluxation generally occurs in young children and adolescents. The patient is often presented with cervical pain, head tilt, and limited and painful neck movement (cocked robin position). There are four different types of rotatory atlantoaxial subluxation in classification. In Type I, the atlas is rotated on the odontoid without anterior displacement. In Type II, the atlas is rotated on one articular process with 3–5 mm with anterior displacement. Type III consists of rotation of the atlas with anterior displacement >5 mm. Type IV is explained by rotatory fixation with posterior displacement of atlas.,, Type I and II subluxations are most commonly seen and have no neurological deficits. In our clinical experience, Type I (4 patients) and Type II (2 patients) subluxations were the most common diagnosed traumas like in the literature with normal neurological examination. In this type of traumas with intact transverse ligament, treatment modality consists of reduction with traction and subsequent immobilization with a SOMI or a cervical collar for 10–12 weeks., The reduction was performed with cervical traction by Gardner-Wells tongs in two patients with excess rotational subluxation. Between Type I and II subluxation, the degree of rotation was the main radiological criteria in the determination of the treatment procedure in our experience. After the reduction, SOMI was performed for 12 weeks and observed satisfactory clinical results [Figure 2]a, [Figure 2]b, [Figure 2]c, [Figure 2]d, [Figure 2]e, [Figure 2]f, [Figure 2]g, [Figure 2]h. Meanwhile, in our series, we observed no Type III and IV subluxation. Particularly, the transverse ligament must be evaluated carefully by multisliced MRI before reduction in order not to have neurological deterioration according to our experience. In our series, Type I and III odontoid fractures were successfully conservatively managed. However, between these two types of fractures, duration and type of orthesis show differences, and in Type I, odontoid fractures were followed with Philadelphia collar by 4 weeks and in Type III were treated with SOMI for 10–12 weeks. Type II fractures who has dense displacement with <6 mm in nine patients were treated with halo or SOMI for 12 weeks. The last patient in this group with traumatic os odontoideum was operated to avoid severe atlantoaxial instability. Eight patients with Type II fracture >6 mm dense displacement were indicated for surgery. According to literature and our knowledge, all Type II odontoid fractures with >6 mm dense placement require surgery; however, in our clinical experience, we could only operate 50% (4 patients) of patients of Type II odontoid fractures. As a result of this, Karnofsky performance scale and patient's treatment choice are one of the main determining factors for the treatment modality. Occipitocervical fixation, C1–C2 wire fixation, C1–C2 transarticular screw fixation, and C1–C2 segmental screw fixation are the main types of posterior stabilization techniques for odontoid fractures. For all these occipitocervical stabilization techniques, thickness of occipital bone, pedicle of C2, lateral mass of C3–C6, and VA anomalies should be evaluated preoperatively by CT images. In case of high riding of VA, it is inevitable to damage the VA during screwing to C2 pedicle and also unilateral absence [Figure 1]i or hypoplasia of VA, and an alternative surgical method should be considered. For C1–C2 wire fixation, procedure is a common and a well-known procedure and has the advantage of VA protection without any risk. The requirement of an intact posterior arch of atlas-axis, the use of a halo west for 10–12 weeks after surgery, and risk of spinal cord injury (5%–7%) during procedure are the disadvantages in this technique. We performed this technique in Type II two odontoid fractures with >6 mm dense displacement and other 2 atlas fractures with ruptured transverse ligament patients. In the beginning of our series, we chose posterior wiring method as a safe and well-known treatment modality, but after our own clinical experience, we also do not prefer to choose this method anymore because of the disadvantages mentioned above. C1–C2 segmental screw fixation is the main approach to atlanto-occipital instability. This surgical technique is first described by Goel and Laheri. It was modified by Harms and Melcher. Low risk of VA injury and biomechanically high fusion rates and the unnecessary intact posterior arch of C1–C2 are the advantages; however, it is a long-lasting learning procedure to get well experienced.,, We applied this method to one of our traumatic os odontoideum patient successfully after having an enough experience by cadaveric dissection of this complex region [Figure 3]a, [Figure 3]b, [Figure 3]c, [Figure 3]d.
Traumatic spondylolisthesis of the axis or so-called Hangman's fracture is a fracture which involves both of pars interarticularis of C2. The most common used classification system of Hangman's fracture is the grading system of Effendi et al. This grading system was revised by Edwards and Levine. The rigid immobilization is the accepted treatment modality of all Levine–Edwards types. Four of five patients with Hangman's fractures were treated with external orthesis successfully. Meanwhile, assessment of radiological alignment has a great importance for the decision of the early surgery. Surgery was preferred who has Type III fracture with severe translational and excess angulation. In postoperative 5-year period, although the patient has a residual deformity, no functional restriction or any symptomatic pain was signified [Figure 6]a,[Figure 6]b,[Figure 6]c,[Figure 6]d,[Figure 6]e,[Figure 6]f.
The treatment decision of combined C1–C2 fractures should be given according to transverse ligament intactness and type of odontoid fracture., In our series, nine patients were followed with external orthesis without any problem. Combined C1–C2 fractures are account for approximately upper cervical spine fractures with 12%. Similarly combined C1–C2 fracture rates were determined as 10.3% in our series. However, in the literature, neurological complications were reported in between 12% and 34% in this group of patients. Controversial to the literature, no neurological problems were detected in our experience. The description of miscellaneous C2 fractures was defined by Hadley et al. in 1985 to exclude all odontoid and Hangman's fractures. 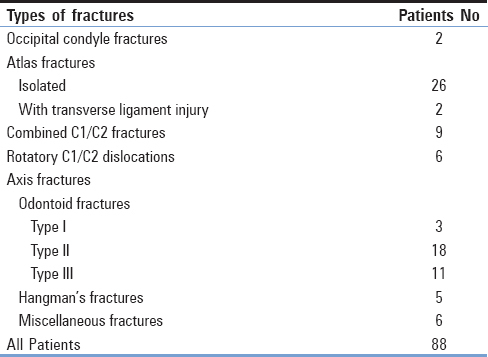 Miscellaneous C2 fractures represent about one-quarter of all C2 fractures. In our study, miscellaneous fractures of six patients had no ligament injury who were treated successfully with external orthesis. There are different diagnostic and treatment modalities in the injured structures of the upper cervical spine and craniovertebral junction due to the complex ligamentous and vital neurovascular structures. During the surgical planning of this complex region, the bone and vascular structures particularly VA should be carefully radiologically considered for a detailed examination for every patient. Determination of fracture pathophysiology and type of fracture are the leading factors in choosing treatment modality. On the other hand, according to our clinical experience, patients' health condition, patients' treatment preferences, and also surgeons' experience are the other influencing parameters. We believe that C1–C2 segmental stabilization is the most appropriate surgical modality for atlantoaxial stabilization after having sufficient knowledge of this complex area and clinical experience. Jhawar SS, Nunez M, Pacca P, Voscoboinik DS, Truong H. Craniovertebral junction 360°: A combined microscopic and endoscopic anatomical study. J Craniovertebr Junction Spine 2016;7:204-16. Dagtekin A, Avci E, Kara E, Uzmansel D, Dagtekin O, Koseoglu A, et al. Posterior cranial fossa morphometry in symptomatic adult chiari I malformation patients: Comparative clinical and anatomical study. Clin Neurol Neurosurg 2011;113:399-403. Şengül G, Kadıoğlu HH. Morphometric anatomy of the atlas and axis vertebrae. Turk Neurosurg 2006;16:69-76. Riascos R, Bonfante E, Cotes C, Guirguis M, Hakimelahi R, West C, et al. Imaging of atlanto-occipital and atlantoaxial traumatic injuries: What the radiologist needs to know. Radiographics 2015;35:2121-34. Joaquim AF, Ghizoni E, Tedeschi H, Yacoub AR, Brodke DS, Vaccaro AR, et al.Upper cervical injuries: Clinical results using a new treatment algorithm. J Craniovertebr Junction Spine 2015;6:16-20. Roy AK, Miller BA, Holland CM, Fountain AJ Jr. Pradilla G, Ahmad FU, et al. 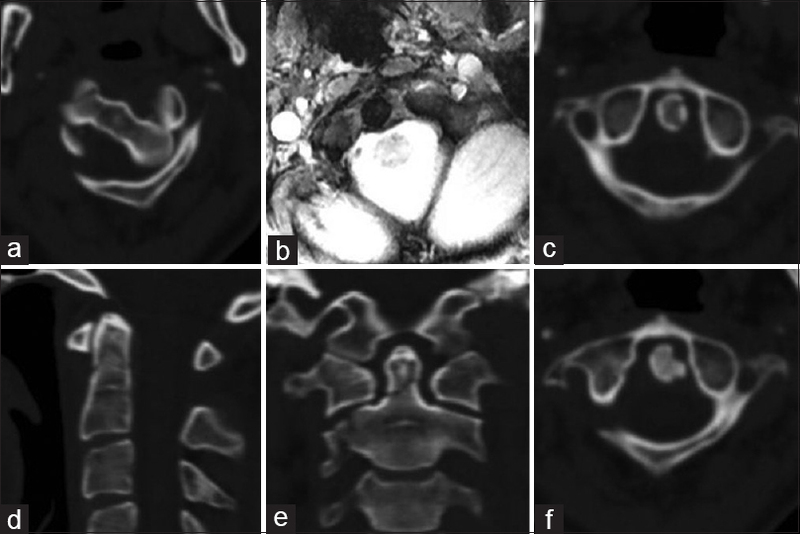 Magnetic resonance imaging of traumatic injury to the craniovertebral junction: A case-based review. Neurosurg Focus 2015;38:E3. Dickman CA, Greene KA, Sonntag VK. Traumatic injuries of the craniovertebral junction. In: Dickman CA, Spetzler RF, Sonntag VK, editors. Surgery of the Craniovertebral Junction. New York: Thieme; 1998. p. 175-96. Vieweg U, Meyer B, Schramm J. Differential treatment in acute upper cervical spine injuries: A critical review of a single-institution series. Surg Neurol 2000;54:203-10. Furtner J, Woitek R, Asenbaum U, Prayer D, Schueller-Weidekamm C. Occipitocervical junction: Aanatomy, craniometry and pathology. Radiologe 2016;56:375-86. Li G, Yang Y, Liu H, Hong Y, Rong X. 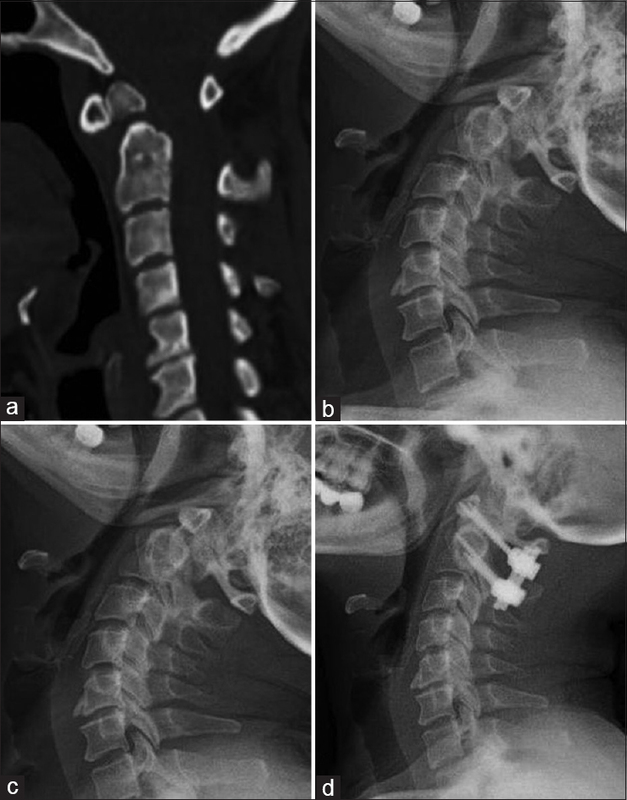 Residual deformity after anterior cervical discectomy and fusion for unstable Hangman's fractures. World Neurosurg 2017;108:216-24. Goel A, Jankharia B, Shah A, Sathe P. Three-dimensional models: An emerging investigational revolution for craniovertebral junction surgery. J Neurosurg Spine 2016;25:740-4. Bell C. Surgical observations. Middlesex Hosp J 1817;4:469-70. Anderson PA, MontesanoPX. Morphology and treatment of occipital condyle fractures. Spine (Phila Pa 1976) 1988;13:731-6. Levine AM, Edwards CC. Fractures of the atlas. J Bone Joint Surg Am 1991;73:680-91. Smith RM, Bhandutia AK, Jauregui JJ, Shasti M, Ludwig SC. Atlas fractures: Diagnosis, current treatment recommendations, and implications for elderly patients. Clin Spine Surg 2018;31:278-84. Bocciolini C, Dall'Olio D, Cunsolo E, Cavazzuti PP, Laudadio P. Grisel's syndrome: A rare complication following adenoidectomy. Acta Otorhinolaryngol Ital 2005;25:245-9. Guleryuz A, Bagdatoglu C, Duce MN, Talas DU, Celikbas H, Köksel T, et al. Grisel's syndrome. J Clin Neurosci 2002;9:81-4. Wetzel FT, La Rocca H. Grisel's syndrome. Clin Orthop Relat Res 1989;240:141-52. Yang SY, Boniello AJ, Poorman CE, Chang AL, Wang S, Passias PG, et al. 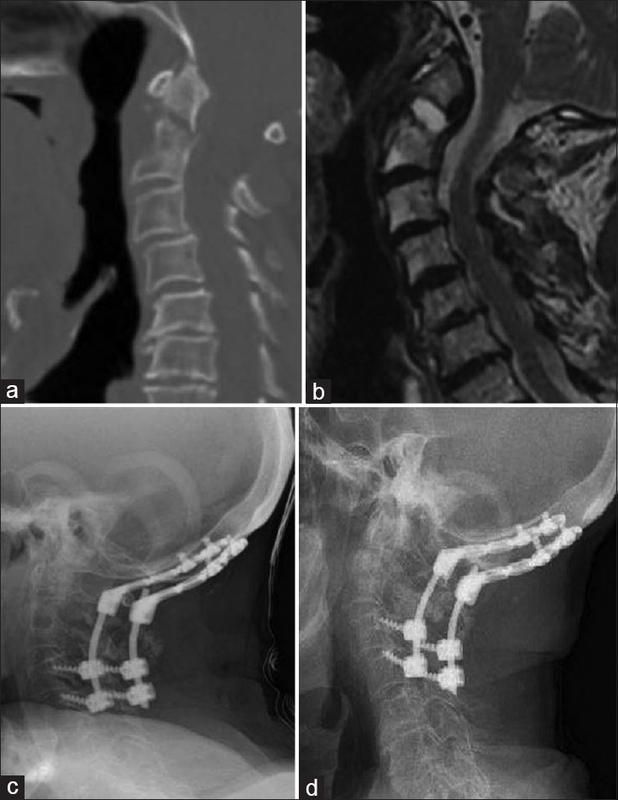 A review of the diagnosis and treatment of atlantoaxial dislocations. Global Spine J 2014;4:197-210. Hadley MN, Browner C, Sonntag VK. Axis fractures: A comprehensive review of management and treatment in 107 cases. Neurosurgery 1985;17:281-90. Aebi M, Bazarian S. Classification of upper cervical spine injuries. Orthopade 1987;16:27-36. Chakrabarti I, Tredway TL, Khoo LT. Posterior atlantoaxial fusion: Surgical anatomy and technique options. Fessler RG, Laligam S, editors. Atlas of Neurosurgical Techniques Spine and Peripheral Nerve. New York: Thieme; 2006. p. 128-38. Menendez JA, Wright NM. Techniques of posterior C1-C2 stabilization. Neurosurgery 2007;60:S103-11. Resnick DK, Benzel EC. C1-C2 pedicle screw fixation with rigid cantilever beam construct: Case report and technical note. Neurosurgery 2002;50:426-8. Effendi B, Roy D, Cornish B, Dussault RG, Laurin CA. Fractures of the ring of the axis. A classification based on the analysis of 131 cases. J Bone Joint Surg Br 1981;63-B: 319-27. Levine AM, Edwards CC. The management of traumatic spondylolisthesis of the axis. J Bone Joint Surg Am 1985;67:217-26. Stulík J, Vyskocil T, Sebesta P, Kryl J. Combined atlantoaxial fractures. Acta Chir Orthop Traumatol Cech 2005;72:105-10. Lin B, Wu J, Chen ZD, Zeng W, Liu Q, Dai L, et al. Management of combined atlas-axis fractures: A review of forty one cases. Int Orthop 2016;40:1179-86.